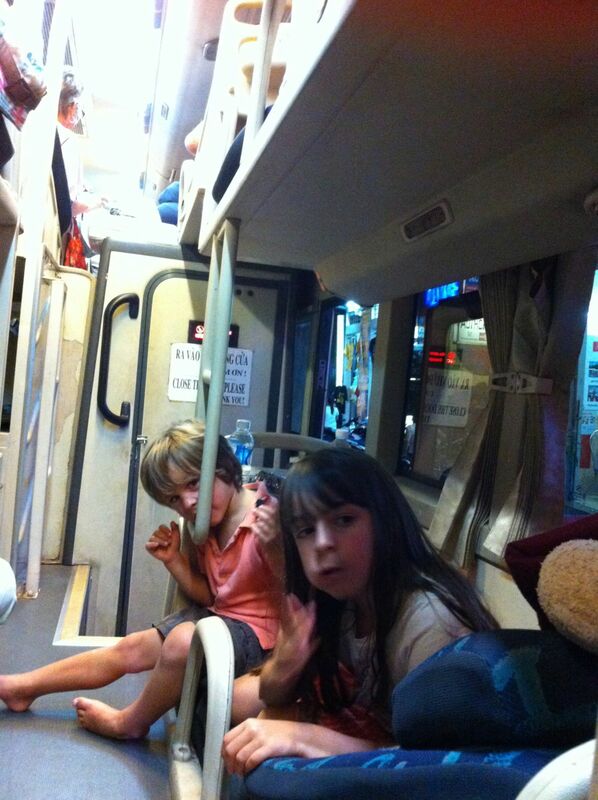 We've heard great things about overnight bus rides in Vietnam. You fall asleep in comfortable reclining bed, the swaying of the bus actually puts you to sleep and wake up when the bus arrives at your destination at 6am. We've also heard they are usually not crowded and if you stay towards the back of the bus you don't hear the drive honking his horn all night. We bought 3 tickets hoping the kids would sleep together and crossed our fingers a free seat would be available. So after an awesome week in Nha Trang, we packed our bags, gathered the kids, and walked the 2 blocks to the bus station office to catch the 7pm overnight bus to Hoi An. As the bags are being loaded on the bus and 5 minutes before departure B tells us he is not feeling well. Uh, oh. His face is super hot (fever). Do we stay or go and hope he sleeps the entire ride? Chancing it, we go! Little did we realize the bus would be packed to the brim with people and bags. As we got on, claustrophobia immediately struck. We had to turn sideways and shuffle down the isle to our seats in the far back. We found our seats. Like a reclining, almost flat, seat on a budget airline. Perfectly sized for a Vietnamese person. Pretty tight for mom and dad. Certainly not big enough for two kids or for a mom and a baby to share! Fast forward 10 minutes (5 minutes into the bus ride) and B is screaming that his ear hurts. Uh, oh, ear ache. Gave B tylenol and hoping for the best. B ended up sleeping in the isle between us. He screamed on and off through the night. Cam woke every hour when he tried to roll over and there was no room for us. I had a sleepless night. On the upside, I got to enjoy the beautiful night time country side of Vietnam. The boats on the water were a stunning site.